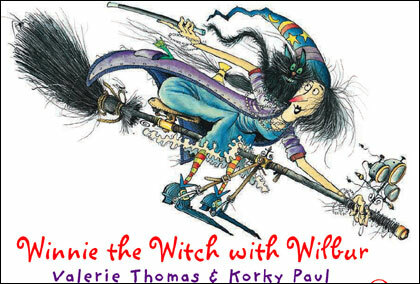 I had a great response for the Winnie the Witch giveaway! This was my first giveaway and was so much fun to host. You are all obviously getting into the Halloween spirit. In the end a winner had to be chosen. I picked at random and the winner is Sally Willcock! Thankyou to everyone who entered, and please check back soon for a bumper giveaway in November. This will include a book by Michael Morpurgo and some beautiful illustrated postcards. Check back soon. ps. Thankyou to the lovely Korky Paul for telling me off about spelling his name wrong. Oopsy. What I love about this edition is that it looks genuinly vintage. 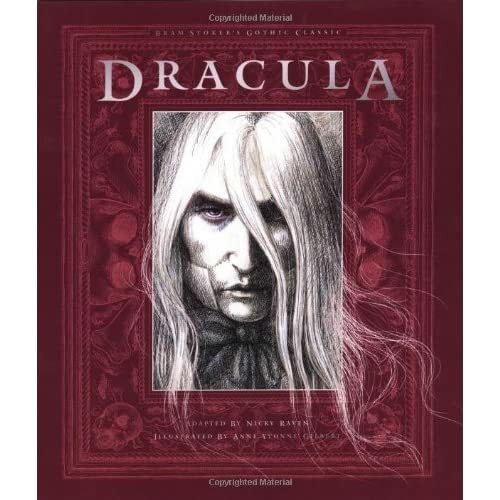 The blood red cover draws you in and Dracula holds your attention with his deadly glare. With his crazy, wild hair seemingly coming out of the book, who are you to resist the thrall of the first vampire. He is the original undead, before the new-found Edward Cullen’s came to be and the book is unadulterated horror. ‘Dracula’ really is a fantastic gothic book and the subject for much literary debate. Whilst Stoker didn’t ‘invent’ the vampire, his work is considered the turning point for gothic horror stories about the undead and should be read by all children if they are to appreciate the wealth of vampire fiction available to them today. This edition has of course been adapted for younger readers but it still maintains its epistolary format through letters and journal entries. It is a most frightening book in its original form but the content has been tempered down, whilst the historical reference remain. 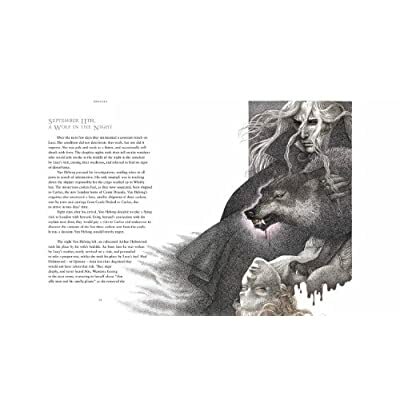 The illustrations, by Anne Yvonne Gilbert are impressive and take on the format of etchings in a journal, using scratchy black ink on a white background. They are very emphatic of the story and paint the picture of an eery mountain landscape in Transylvania. A fantastic book, a gift for keeps. Templar also had a new edition out in July with similar illustrations. I can’t recommend Templar publishing enough as they maintain the integrity of the original story through their emphatic illustrations. Looks great, now you have a choice. In fact, you have a huge choice in Dracula editions, these are just two of my favourites. This week is just for the teens and young adults among us. I’ve found some thrilling, chilling and disgusting reads to feature this week. If you want a ghost story to read at the dead of night, thrilling classic tales, or a zombie -pastiche on a festive tale then you will find it here at 5 Minutes Peace. Tales of Terrors from the Tunnel’s Mouth by Chris Priestley – horrifying short stories. I Am Scrooge: A Zombie Story for Christmas by Adam Roberts – Marley was dead…to begin with. The Graveyard Book by Neil Gaiman- A curiously creepy tale. Goosebumps by R. L. Stine- a childhood favourite of mine. If those words straight from the magician’s mouth don’t intrigue you, then nothing on this earth will. This glorious fable, now available in paperback is one of magic, mistique and intrigue and perfect for the dark October nights. Amazon description: What if? Why not? Could it be? When a fortune-teller’s tent appears in the market square of the city of Baltese, orphan Peter Augustus Duchenne knows the questions that he must ask: Does his sister still live? And if so, how can he find her? 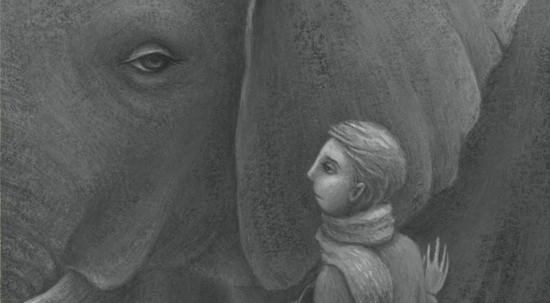 The fortune-teller’s mysterious answer (An elephant! An elephant will lead you there!) sets off a chain of events so remarkable, so impossible, that you will hardly dare to believe it is true. 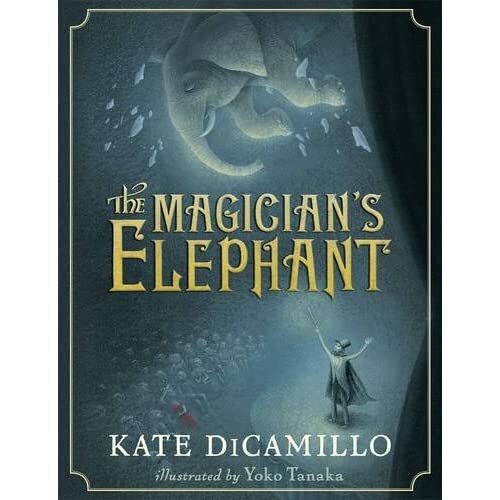 With atmospheric illustrations by fine artist Yoko Tanaka, here is a dreamlike and captivating tale that could only be told by Kate DiCamillo. In this timeless fable, she evokes the largest of themes – hope and belonging, desire and compassion – with the lightness of a magician’s touch. What I really love about this book is how well the illustrations are paired with the story. Kate DiCamillo tells a perfect and often heartbreaking tale through the eyes of little Peter and Yoko Tanaka’s illustrations give him just cause to hope and believe that his sister is still alive. And if we’ve ever learnt anything from Michael Morpurgo, we will know any tale with an elephant is a tale of true worth. The illustrations are haunting and tell a lot of the disparity of Peter’s world. There’s something quite Dickensian about a street performer and the cover seems to reinforce that. It might just be my love for Oliver Twist and the performers in The Old Curiosity Shop but the book certainly seems to draw inspiration from a time when street performers were entertainment but also posed a threat. A beautiful tale that inspires morals and messages throughout. Often confusing and peculiar but a book that certainly makes you smile. A new publication from Usborne this Halloween; Spooky Doodles Activity Cards. These types of activity books always sell well as they keep children entertained for a long time, and the finished doodle cards are something that can be used to decorate their bedrooms for October 31st. In the same illustrative style as ‘Spooky Sticker Book’ featured yesterday, children’s imaginations will run wild as they are given a starting instruction to get doodling. They can draw whatever they want as something creepy lurks under the bed as a little boy sleeps, and if it all gets too scary, not to worry…the cards are wipe-clean and they can start all over again. My favourite card is the bats. I would draw giant mutant bats coming straight out the page towards me. I’m not so fond of the owls though, they look decidedly stern! A fabulously haunting treat and great value for money at £5.99 as you get 50 wipe-clean cards! With this great sticker book, the children get to set the scene and decide how scary they want their haunted house to be. This book features lots of different scenes including trick or treating, Dr. Frankenstein’s laboratory and a monster garden. Stickers include pumpkins, ghosts, ghouls and witches and there’s plenty of stickers to keep the children entertained for hours. Usborne has created another great interactive book for young ones, featuring their infamous illustrative style. 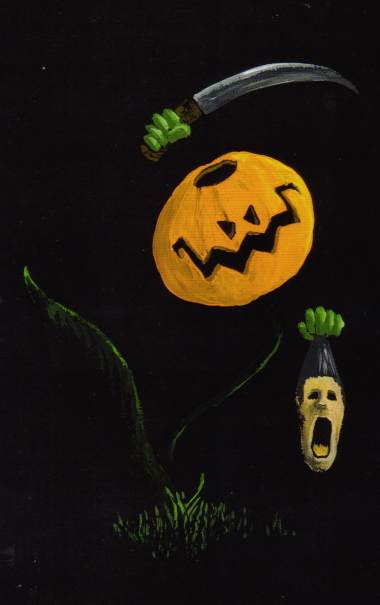 This is easy Halloween artwork, which you can’t go wrong with and certainly wont a make a mess. The only mess you can create is in Frankenstein’s lab. Watch out for strange concoctions and random body parts! Halloween is meant to be a fun, frightening celebration, traditionally of ridding the house of evil spirits. Today it has evolved into a feast of a celebration that stems far beyond good and evil. We have vampires, ghosts, possessions and that’s to name a few. And that’s why, when celebrating halloween with children it’s important not to expose them to something which is beyond their comprehension. A halloween story which is suitable for a teenager certainly may not be suitable for a child of say, nine years old. That’s why I wanted to feature a ghoulish story for younger readers. This one is for the 5-8 year olds. 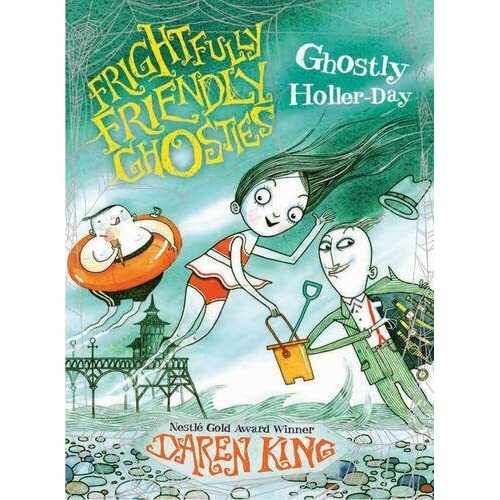 ‘Frightfully Friendly Ghosties: Ghostly Holler-day’ by Daren King, illustrated by David Roberts has a distinct ‘Casper’ feel to it as these ghosts are friendly! Surely any ghost that stays around on this planet is staying round for creepy things? Nope, that’s not the case here. Three friendly ghosts who are friends want to get away from the cold days and the dark wintry evenings and set about planning a holiday (although quite why they think Scareborough and Frighten -on-Sea is going to warm them up is beyond me). If they thought picking a destination was frustrating enough then, sharing their holiday with Headless Leslie without killing him is mission impossible. And of course, what would a halloween story be without a few spooky beings and a very mysterious pier? 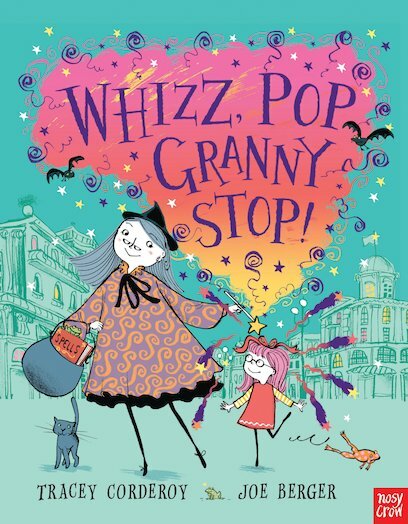 I love this book because it’s harmless fun and reminds us like dear old Casper did that ghosts were people too and just because you can see through them, doesn’t mean they don’t want to have fun and make sandcastles like the rest of us. 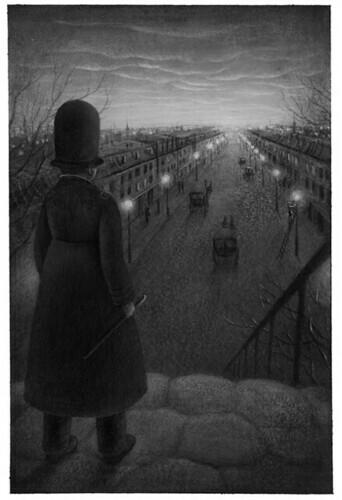 The black and white line illustrations by David Roberts are great, giving the holiday setting of Frighten, a rather mysterious eery feel. Just never trust a magician!